Photo at One week old. I was lucky enough to get to visit with Jaizemieka VDL and her mother Faizemieka on our recent trip to Holland. Faizemieka has been a truly remarkable mother and we wish VDL much success with Jaizemieka at the auction in Borculo! The National Foal Auction of Borculo this Thursday will also auction two of our beautiful foals. They are Zapatero x Zirocco Blue and a Federaux x Lorentin. Jaizemieka VDL descends from one of the best damlines (Aziemieka) of VDL Stud. She has a striking type and powerful canter. Her sire Zapatero VDL (Jessica Kurten) made a great debut in the WOrld Cup Qualifier in Zurich. His eldest progeny shows real jumping-talent. Grandsire Zirocco Blue VDL is a phenomenon in sport and breeding. His daughter Faizemieka showed her talent in performance-test (81.5 points). Her dam jumped at 1.35m level and is by the legendary Darco, who topped the world ranking for years. The Darco-mare is half-sibling of the approved stallion Bugatti VDL. Aziemieka is foundation mare of the Grand Prix horses Everest, Glennridge and Southwind VDL. Jactrice VDL is a very interesting mare out of the first crop of Federaux, who is an approved with a superb result in the performance test. Her dam L'Actrice is the full-sibling of the approved stallion L'Acteur, who competed at Pric St. Georges level. Both are by the Grand Prix stallion Lorentin I (Hubertus Schmidt). Lorentin I already sires several children at Grand Prix Level. L'Actrice is dam of two 'ster' mares. Jactrice convinces with her well-developed dressage type. She is well muscled and moves with lots of posture and impulsion. She is free of Jazz-genes and that provides possibilities for breeding in the future. 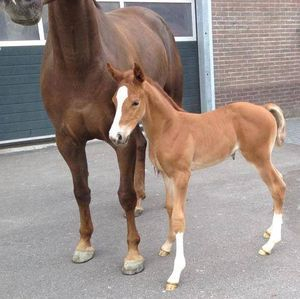 I am pleased to say that we have a new ster mare!! She measured at 1.67m and scored a 70 for exterieur and 75 for jumping. VDL has decided not to send her to the Central Keuring. 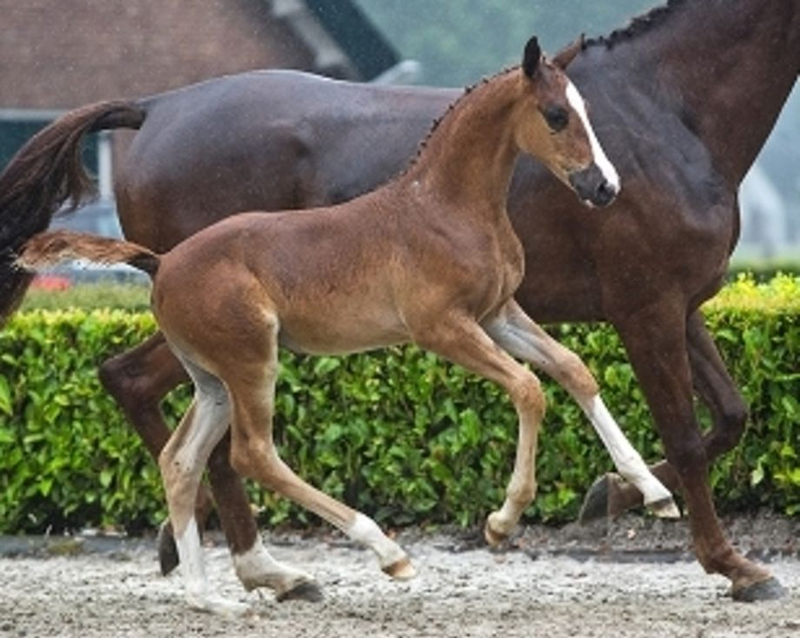 I am excited to have learned that Jaizemieka VDL had a filly by Glasgow van't Merelsnest this year!! She has been named Jaizemieka VDL. Hopefully I can meet them both on my next trip to Holland.